Bought a kit off ebay for 2008> focus and the supplied H8 fog lamp is incorrect. Went to install it this morning and all other bulbs supplied were correct (sidelights, H7 and H1) but my fogs are H11. worth contacting the seller and letting them know! they may send you a replacement bulb! I have been in touch with the seller on e-bay and he has offered to exchange the H8's for a pair of H11's instead. They are much nicer to look at! Feel free to post a link to the purchase you made! You choose from a list of make and models as normal. Quite cheap but longevity is obviously yet to be seen. Having said that, I purchased some "nightbreakers" for my previous car and they lasted all of 3 months! Hi will halogen bulbs fit the titanium x Bi-xenon headlight I think I ordered those instead of xenon bulbs by mistake. Hi Colin if you have Xenon headlights then at least the dipped beam will be an OEM xenon bulb. I think it may be a D3S bulb on the MK3 Focus? Perhaps someone else could confirm? 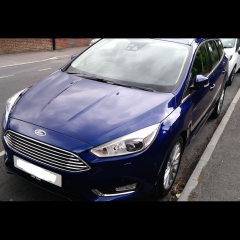 Updated FORD FOCUS MK2 FACELIFT (MK2.5) 2008 onwards. Note: bulbs have offset pins. Interior Light - 501 Capless Map lights / Festoon centre bulb. So thats the main beam the dipped beam is a H7? Dipped beam is your normal headlight that you drive with at night ie two clicks round on the headlight switch. Main beam is otherwise known as full beam and is what you would use when flashing your lights etc or on dark country roads. Got ya now D8S is the dipped beam and full beam is a H7. So ther are 2 full beams when switched to full? sorry for being so thick!!!!! I will check again but I have a D8s then h7 then the corner light in a row then the indicator under that and drl above. Just to add after making the mistake myself.. The interior festoon bulb is a 239. Ordered the wrong size for my led conversion. Also made the mistake of thinking the rear dome light would be a festoon, it's the same as the 501's throughout the rest of the car. As for the number plate bulbs, mine are 501's rather than festoon bulbs. Seems this can vary so i would check you specific car before buying. Could it be that the chrome boot strip uses 501's and the painted one is festoons? and where they can be put, and with what types that wont give canbus errors ?? to get rid of normal filament bulbs !! to be honest, you just search the bulb you want and search LED :) unless your car comes as standard with CANBUS then you wont be affected. You cant use LED Indicators, as they will flash like they have blown, so you would need to manually add resistors into the circuit.